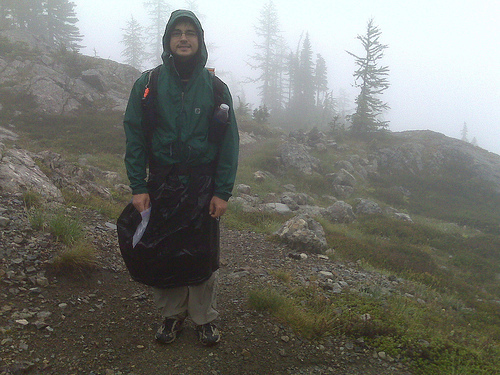 Gear Review:Garbage bag rain skirt. I have been carrying a cinch strap garbage bag for a rain skirt since 2001. It’s light, comes in different sizes, offers great ventilation, is cheap, and works perfectly. The picture is of Laen, sporting a 33 gallon sized Hefty cinch garbage sack weighing 1.6 ounces. I often wear mine even if I’m wearing rain pants, because it has been my experience that all rain pants eventually leak but a trash bag is dependable. Some people make or buy a rain skirt out of sil-nylon. They are more expensive, less water proof, and heavier. I’m thinking of improving my garbage bag skirt with a better cinch cord. I’m also thinking of trying out the 39 gallon size for a longer skirt. Previous Previous post: Washing my raincoat.